Ever look back at your week, and wonder what happened? You started the week with good intentions. In your mind, you’d already written an epic blog post. But then you sat at your desk. A blank sheet stared at you. The words wouldn’t come. Your friend Procrastination peeked his head around the door, distracting you with little tasks, that seemed more appealing than writing that blog post. Can’t find time for writing a weekly blog post? Does blogging feel like an enormous task? 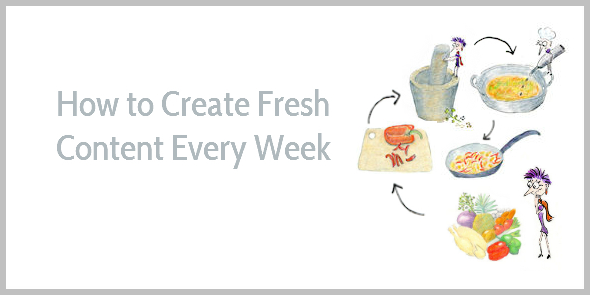 The “secret” to committing to a regular blogging schedule is simpler than you might think: chop up the writing process. Want to feel good about your weekly writing? Chicken saté. Prawns in yellow curry. Beef rendang. Stirfried veggies. Pickled cucumber with pineapple and tomato. Prawn crackers. Rice. Mango sorbet. To prepare your meal, you think about different processes like chopping, grinding, and cooking. You also consider which dishes you can prepare beforehand. A curry can be prepared the day before, while veggies have to be stirfried just before your meal. With writing blog content it’s the same. You don’t have to do everything all at once. Cut the process into steps: idea generation, outlining, writing a crappy first draft, editing, and formatting. Also, consider the different parts of the post: the headline, opening, main body, and final body. Do you keep a notebook or folder with blog post ideas? If you don’t, then you need to schedule 30 minutes for a brainstorming session first. Think about your ideal reader, and consider what problems you can solve for him. How can you help him be more productive, get happier, healthier, or wealthier? Write down at least 30 ideas in 30 minutes. Keep all your ideas on a list, and add ideas whenever people ask questions or provide useful comments. If you keep your eyes and ears open, you probably need to do a brainstorming session only once a year. You’ll hardly ever run out of ideas. Browse through your notebook, and pick an idea. Write a working title (a how-to works best). Make sure your working title explains how your reader will benefit from reading your post. Which problem will it solve? What will he learn? Outline your post by jotting down preliminary subheads; think about the examples you can use or the mini-stories you can tell. If you’d like to add quotes or stats, or need to do other research, do this on day 1, too. When you write a first draft, you don’t want to get distracted by research, so you can write as fast as possible. Make your first task as small as possible so procrastination doesn’t get a chance to sabotage you. Some people say writing gets easier over time. But in my experience, writing is like cycling uphill. When your fitness improves, you get faster to the top, but your legs still hurt as much. I hate writing a first draft. I have to overcome so much resistance, that I try writing first drafts when I feel groggy—before breakfast. At that time my mind doesn’t have enough energy to rebel. The opening paragraph can feel tricky to write, so skip for now. Set a timer for 25 minutes and write your first draft as quickly as possible. After 25 minutes, take a 5-minute break, make yourself a cup of tea or coffee, and then challenge yourself to finish your first draft in another 25 minutes. Depending on how fast you type and how long your drafts are, you might need less time or a little more. Don’t worry about the final paragraph, it’s better to write it when you feel fresh, as it makes you more enthusiastic. Shut the door, switch off your phone, and close your browsers. And stop worrying about exact wording. Write as fast as you can. Your headline must grab attention; it can make the difference between so-so social sharing and a popular post. Write at least a dozen headline options, because your first option is rarely the best. Nobody reads a post with a drab opening, so your opening must tempt visitors to read on. The best format for blog openings is to empathize with your reader’s problem and promise him that you solve it in his post. Your closing paragraph must inspire your reader to take action. Don’t let your post fizzle out. Take away an obstacle to implementing your advice or give your reader a pep talk. To grow your influence online you must get people to read, share, and act on your advice. That’s why the headline, opening, and closing are critical. Editing your post is like carving a pretty flower from an ugly carrot. Want readers to enjoy your posts? Editing is where the magic happens. Don’t forget to pat yourself on your back for publishing your post! Each blog post you write is an opportunity to engage your fans. To get more shares. To gain more traffic. To grow your authority. To find new readers. To win more business. But when you don’t block time in your calendar, tasks don’t get done. Don’t let blogging slip to the bottom of your to-do list. Stick to a schedule that works. Grow your audience. Build your business. And be proud of your work. Perfect!! Clear directions, do-ably inspiring ! Thank you. This enchanting person is enchanted by your post. I think the most important part of your article is the last point “Day 5. Format, publish and promote your post” The promotion part is the most difficult for me. I think it’s the part where I procastinate the most too. Do you have any tips for this part? Also, if you write a series of headlines for your post, then you can use a few of these to share your post on Twitter several times (or your favorite soundbites from the post works, too). I also often re-use the opening (or my email text) for Google+ posts, making it less time intensive. I dislike social media too hehe. I tried once sending an email to the people involved in my article (architects, cultural centers…) and it worked quite well. Instead of being me promoting through my social networks, it was them promoting my article through theirs. Building up an email list has been the best promotional tool for me. More effective than social media. One thing to consider is putting your city guides behind an opt-in form. I’m not sure whether you can do that on a wordpress.com blog, but it would be a good way to build an email list and notify people each time you have a new blog post. Copyblogger do something similar with their library of ebooks. That’s a good one. I should learn how to do that because right now I’m giving it completely for free. And it applies to “normal” book writing too. Thanks for reminding me Henneke!! Yep, I agree. What I like with book writing, is that when I don’t feel like writing a draft of the next chapter, I can edit a chapter I’ve written already. So, it’s easier to make progress. But it only works if you have a good outline. True Henneke – the outline is everything,. It gives you freedom to move elsewhere in the book if you get stuck on a particular chapter. Inspiration is never much of a problem for me. It’s the sitting down and actually writing the post where time just seems to slip right through my fingers. I’ve been telling myself to write down the 3-day process in my diary: outline idea and fill in my post template on day 1, write it on day 2, polish and publish on day 3. I think I’ll give your idea of writing with a timer a go. I just hope I won’t get nervous from seeing the seconds ticking away. Maybe if I turned its screen away from me? For me, the timer only works when it’s visible. For instance, sometimes I cheat (we all do sometimes, right?) by checking Twitter even though I know I need to write my first draft, and I only have 50 precious minutes to do it. When I see the timer counting down and I notice I’ve already wasted 3 or 4 minutes, I know I can’t fool around anymore. I have to get to work on that draft. I also find that my mind starts wandering off after 20 minutes or so, but then I notice that I only have a few minutes left, so I try hard to make the most of those last few minutes and get another paragraph written. Awesome post, that sounds like me. Started on a new blog post yesterday and there it is hanging around the non-published blog posts that will never be published if I don’t start taking control. And all those ideas that come up while doing other things in and around the house – gone….can’t even remember what they were. I’m going to have to try doing things this way. When I start writing a post, I always have the intention to finish it in a few days. To leave it for later (without a specific date), doesn’t work for me. I’ve done that a few times in the past, but those posts never get finished. Really great post here. I love the blogging schedule you shared. I think you mentioned some variation of it before, but I never implemented it. Will try it this way because it seems to really be working for you. I know for myself, I spend TOO MUCH time on one post. I need t cut it down drastically. Yeah, I always think I spend too much time on one post, too. But what’s the yardstick? When I try to go faster, then usually I slow myself down. In my experience, breaking the process down in chunks and writing over several days, can help write posts quicker. The timing of this post was perfect for me today. I am working toward creating more consistent content to share. This was fabulously helpful. I really appreciate all I have learned from the information you share. Thank you for being so generous and supportive. Bless you. All great reminders, Henneke. As for ideas, I keep notebooks everywhere in my house, including my nightstand. So many times I’ll read or watch TV when things start bubbling up. I jot them down, sometimes just a few lines, sometimes an entire blog post will emerge! I love the security of having an inventory. I never know when I’ll pick one off the shelf. You sound far more organized than me, Laurie! What I would like to hear you speak to is focus and choosing. I feel like I can do many things but want to do what really has my name on it. How did you decide on business blogging. You must have considered other possibilities. I started writing about business blogging and copywriting more or less by accident. I was learning how to write, and I found it fascinating. Initially, I wanted to start a content marketing consultancy. But I didn’t want to start an agency, and I found that content marketing was too big a topic for me. There was so much to learn that I didn’t feel I could ever become an expert, so I focused on what I was learning about writing. (I also found that working as a consultant didn’t suit me, so I switched to teaching courses, which I like much much better). In a way, I’m surprised that after three years, I’m still writing about writing. I haven’t got bored yet. I do sometimes blog about other topics, but probably 3 out of 4 posts is about writing in one form or another. This is a similar process I go through un order to create a blog post. The reason for this is that I’m pressed for time and it’s more convenient for me to divide it up each day. As a result it comes out to be a great, valuable post that my readers can use instantly. Thanks for the tips! This shows that I’m doing things right 🙂 Have a good one! Yep, that’s exactly why I think this is a good way to write for busy people. You don’t have to block half a day, you can block 10 minutes on the first day, an hour on the second day, etc. Glad it works for you, too! Yet another crunchy piece worthy of a gazillion tweets (sorry I can only afford one or two). I read this to the bottom and made sure to archive it. Why? Because it would be doubly useful from now on. I found different writing methods work for different writers. Like I love to write my first draft before bothering with research, headline, and subheads (interestingly though, they sort of always come inbetween). And of course, this epic snack isn’t ruling out the fact you should follow a method that works for you, right? But I sure would recommend this for myself and my blog readers. It’s highly relevant. Thanks a lot for sharing, Henneke. Yep, sure. You should find the rhythm that works for you. You don’t have to stick to the 5-day schedule. What’s most important is having a regular schedule, and sticking to it. And most people find it easier to spread the work over at least two days. Clever tips. I think I’m going to try this starting today. Notebooks are handy. I’ve always kept one. Ideas don’t keep appointments! They just crash in whenever they feel like it. Good tips for getting content started, done and edited. I really have to get tough with myself sometimes. For instance, I’ve had to get a desk and actually sit down at it. Yup, who knew! 🙂 Usually, I’m sitting down on the settee with laptop warming my lap. Sometimes, this works for getting content done. Sometimes not, that’s when the desk comes in handy. My other source for getting writing is to read one of Bernadette Jiwa’s short posts (5 minutes reads). She’s like an ideas factory. I think we all have to figure out what distracts us and find ways to stop the distractions – whether it’s moving to a desk or shutting the door or closing our browsers. Once I accepted that I struggled with writing first drafts, I could try out different ideas to get over my resistance. Wao! “An Enchanting Evening….” Nice song! And 5 Enchanting suggestions to follow. You had done it again lady, teaching us how to not procrastinate and be organize when starting to writing blogs. Thanks again for the free lesson! As a poet, you’re allowed to procrastinate, aren’t you? [ Smiles ] Great points, Sherman. However, the part about using a timer is a bit daunting! I now find using a timer less daunting than trying to write without a timer! Just discovered you two weeks ago and I am loving your material – working through two of your books as we speak. I wanted to thank you for this post and also for writing so openly about your own struggles with self-doubt and procrastination. I’m definitely going to try this approach. Breaking it down into steps makes it seem not so overwhelming. Reading two books at once? I hope you’ll find them both useful (without feeling overwhelmed!). I don’t think anyone would feel overwhelmed after reading your post Henneke. Logical bite size and hassle free approach. Loved it! Now, there’s an idea! I’d love to be writing this while in Malaysia. But if I’d been in KL, then I would have let you know! Thank you as always for actionable material! Your step by steps are really amazing, so doable, so clear. Do you ever do the entire process in one day? Most weeks devoting 5 (or even 3) days to writing is not possible for me. I’ve tried writing posts in one day when I was just starting out. But in my experience, it took up a lot more time than when I spread the process over more days. The first day (choosing an idea and outlining) probably only takes 10 minutes, or so, so it’s quite easy to fit in. You can then combine for instance day 2 + 3, and day 4 + 5. Or if you struggle with first drafts, then you might want to do only day 2, and then combine 3 + 4 + 5. Try it and see what works for you. I don’t want to present it as a rigid schedule, but more as an overview of smaller steps that you can use to find the ideal schedule for you. It also depends on how long your articles are. Most people find it easier to leave 24 hours between writing and editing. It makes it easier to spot opportunities for improvement. We become also a little less precious about cutting irrelevant paragraphs (that perhaps on the day when we wrote it, we were quite attached to). I really like this process of breaking up blog posts… it makes things way more manageable and less daunting, and it’s the process I’ve adopted for writing blog posts for my clients that require blogging. For example, I take one day to do research, one day to write the first draft, and one day to polish and put on a good conclusion. It’s much less intimidating, and by breaking it up, my mind is much fresher and the content turns out better. Great to hear it’s working for you, too. Like you, I’ve also found that the content turns out better when I spread the work over several days. Thank you for stopping by, Chelsea! Thanks Henneke, I’m going to try this. I’m a newbie at writing. I’ve been trying to get my ideas for putting together a website. The core pages are taking me forever… but I feel like blogging may be easier because it will be focused on one subject, rather than selling our services and products. You can use a similar principle for writing your core pages, too. On the first day, make a list of features and benefits you need to cover, plus objections you need to take away. On the second day, create a rough draft. On the third day, edit your draft. Whatever writing I do, I always spread it out over a number of days. When you allow ideas to percolate, your ideas become clearer and your content gets better. Good luck! I’d never suggest you should stop painting! Find a schedule that works for you. You don’t have to blog every week if that feels too much. Try every other week instead. A regular schedule really helps. Hi Henneke, thanks for sharing. I follow the above when writing but my biggest problem is that I take a lot of time to edit my posts. I hope to work much faster. I spend a lot of time editing, too. It used to upset me (and sometimes still irritates me), but I’ve also found that it’s the part of writing I enjoy most. So I’ve decided the editing takes as long as it takes. What has helped me in reducing editing time is starting with a good outline and a clear idea of the purpose of the blog post, so I don’t need to spend any time re-arranging paragraphs and can focus on making each sentence sound right. I agree that breaking it up in smaller chunks makes writing a blog post less daunting, especially if you’re pressed for time. I really like the idea about brainstorming 30 ideas in 30 minutes! Yes, 3 days can work well, too. I think we all have to find the schedule that works best for us. We all have different demands on our time. Let me know how you get on with your brainstorming session? Have fun! And now I know how to keep moving ahead on my blog the end of this month. Win! Dankuwel, Henneke! Thank you for your amazing tips. These are pretty concise and clear tips on blogging unlike those highly complex and exhaustively long articles. Will try to make a schedule for blogging. Thanks again. Great content! I’ve been publishing a blogpost a week for over two years and I recognize a lot of what you’re writing. But I think we all find our own ways to get the job done. Most important is to keep to the schedule over time. That builds trust and thus an audience. “Want to readers to enjoy your posts? Editing is where the magic happens. Yes, sure. This is not a strict process that everyone must follow to the letter. 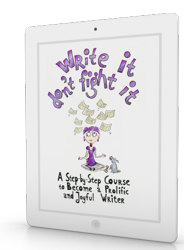 It simply provides one way of chopping up the process and tackling the writing process when you feel overwhelmed. Steps can be combined, the order can be changed, etc. Thanks for letting me know about the typo. I appreciate it. Hi Henneke! I just came cause I saw your newsletter from my inbox (which I am subscribed to using my personal email address for months now), and I wanted to come here to say thank you so much for being one of my marketing inspirations. I think I stumbled upon you after researching on how to write content. I laughed at this line: Editing your post is like carving a pretty flower from an ugly carrot. Which feels very true. Thanks for writing this post. I’ve bookmarked it and it’s 4AM here in Philippines but reading this is like having breakfast. 🙂 You’ve put a smile to my face. Also, I enjoy your mini email snacks. I really love how digestible they are. Not a lot of writers/marketers can have that effect on me. Your writing is very enjoyable. Thank you for your lovely comment. Happy writing! I have a fundamental question about blogging that’s been bugging, and holding me back for a while. If I want to write about something creative I’ve been inspired by, for example, an art exhibition, or an interesting new material, that I think will be of interest to my contacts (the design community) then what ‘angle’ should I put on it if it’s not solving any problem? Hi Lynne – That’s a different type of blog post than what I usually write (I always write tutorial-type posts where I solve a problem so people can learn something). In your case, it’s less about solving a specific problem. By sharing what inspired you and how it inspired you, you look to inspire your audience, too. Does that feel better? What an awesome post Henneke! Although this is my very first visit to your blog. extremely fresh, “how to” problem solving content. And I really like your process and strategies in tip # 4. It’s extremely detailed orientated!Thanks so much for sharing your process. I swear you were writing to me. I flake out of writing all the time; much to my frustration. This is just the motivation and plan of action that I need to do this properly. I hope the plan works for you, too. Let me know? Great post, thanks. Very clear. I started a every other day video blog but I hate videos and I would like to switch to a weekly written blog. So I will try to stick to this and see if I can put together good content for a higher level of followers. Thank you! I am not keen on videos either. I prefer writing 🙂 Happy blogging! Thank you, Patricia. Happy writing!